So I’m finally sitting down to write what is my long overdue final Japan blog. Although this may be my last entry in recounting what has been without a doubt the best trip of my life, after my absolutely unimaginable 4 weeks in Japan, I can certainly say that this is far from my final time I’ll be writing about my experiences in the Land of the Rising Sun. 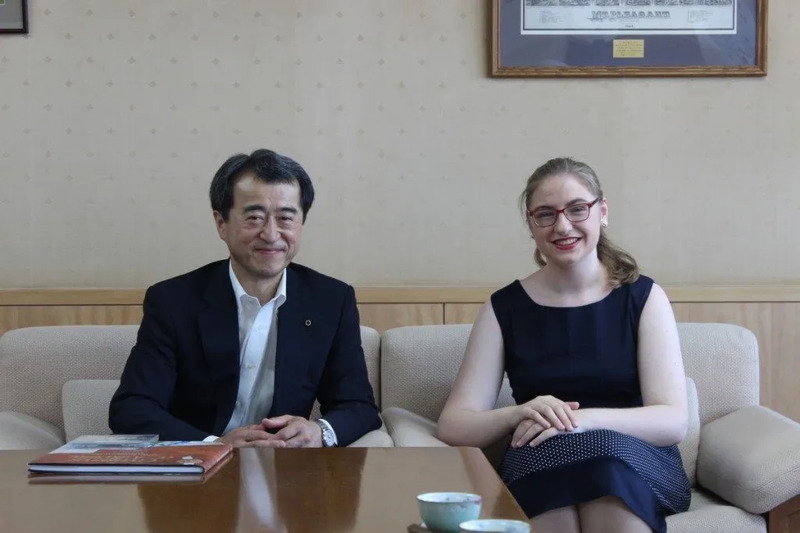 One of the aspects of this trip that I was considerably the most nervous for was my meeting with the mayor. It wasn’t that I hadn’t done anything of the like in Ireland before, but it was the sheer grandeur of the City Hall that looked like it should belong in The Hunger Games’ Capitol before a city in the middle of the Japanese Alps that scared me the most. We were directed into this rather comfortable reception room while we waited for the Mayor to make his grand entrance. It was at this point that three reporters, each from different companies began asking me questions and telling me that they would be taking pictures during our meeting (needless to say this did about as much to help the nerves as seeing the immaculate china my green tea was being served in) When the mayor finally came in and our conversation began, I finally started to calm down when I realised that we wouldn’t be discussing controversial governmental treaties but simple things like what was my favourite Japanese food (Now all regular readers of Okaya City’s three local newspapers know my favourite Japanese foods are Ramen and Yakisoba!) After the Mayor had made his exit I was surrounded again by the reporters who continued asking me questions, including those about my opinion of Brexit (Yes unfortunately hundreds of years of Anglo-Irish struggles are rarely known at this side of the world) This was not a surprising question though because when I appeared on the local radio some days before, yet again was I faced with this question among many others about what I think of Japan (there I was again letting even more of the population of Okaya know what my favourite foods were) I felt quite the celebrity though when I had a teacher in my high school come up to me one day, giving me the article I was featured in, and telling his class about it! 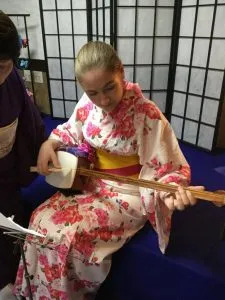 One of the things I failed to mention in one of my previous blogs because it was simply so great I thought it deserved a section in itself, was getting to try and play the traditional Japanese instrument called the Shamisen. Kitted out in my Japanese Yukata , we headed to hear a traditional Shamisen performance, a performance so beautiful that it sounded exactly like one of those 1 hour meditation music videos you would find on Youtube. Hearing the beautiful sounds in real life and watching the amazing skills of the two players in action, it was really something incredible. When their performance ended they even gave us a chance to try and play, teaching us the Japanese song ‘Sakura Sakura”. Although my ability was far from being called decent, it was still a fantastic experience that brought me to love Japanese culture even more! Speaking of Japanese culture, a tradition that is unique to the Suwa area is the festival held every 7 years going by the name of ‘Onbashira’. If you know anything about this festival you know that it is considered the most dangerous festival in Japan where men ride huge logs down steep slopes and hills as a way to symbolically renew the four shrine buildings at the Suwa Grand Shrine by placing these huge logs as pillars on each of the shrine’s corners. The Festival was held earlier in the year and lucky for me, I got the chance to visit one of the locations where it all took place. The view from the top of the hill was breathtaking and seeing a remaining log left as a monument from the event, it was unbelievable imagining the excitement and thrill this event brought and brings the region every few years. And now to speak of my last day in this amazing country I am so lucky to say I have been to. Saying goodbye to all my new friends at school was very upsetting and it took all my will to keep the tears spilling, but luckily I held it together and though I had only just began to feel like a proper member of this wonderful school, I left the school that had given me so many unforgettable memories with a smile on my face. My host family decided to throw me a Takoyaki party that night where we all made and ate takoyaki (fried dumplings with octopus) My host mother also made me my favourite Japanese foods and gave me such beautiful presents that I really don’t know if I deserve. Our little party was incredibly fun and shook off if only for a while, some of the sadness I was feeling in leaving. 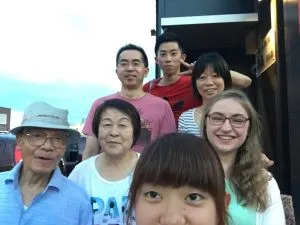 Unfortunately though emotions were running high when I had to leave that morning at 4:45am and saying goodbye to my host family was one of the hardest things I have ever done in my life. These people were to me an extension of my own family and I will be forever grateful for their kindness. Japanese people don’t usually hug but in that moment I couldn’t help it, so there we were in front of a very confused Taxi driver hugging and crying and saying our goodbyes. I can’t wait to one day show them Ireland so that if only in some way I can repay them for treating my like their own daughter and sister. And there you have it, my time in Japan. I don’t think I’ll ever be able to thank everyone at EIL Explore enough for allowing me this experience of a lifetime and for everyone who helped me all throughout this experience, Miyoko Sensei, Itsuki san thank you ever so much! In coming back to Ireland I almost experienced something like reverse culture shock, but after being back for awhile now, my experience sometimes feels like a crazy dream that I never ever want to forget! Until we meet again Japan!